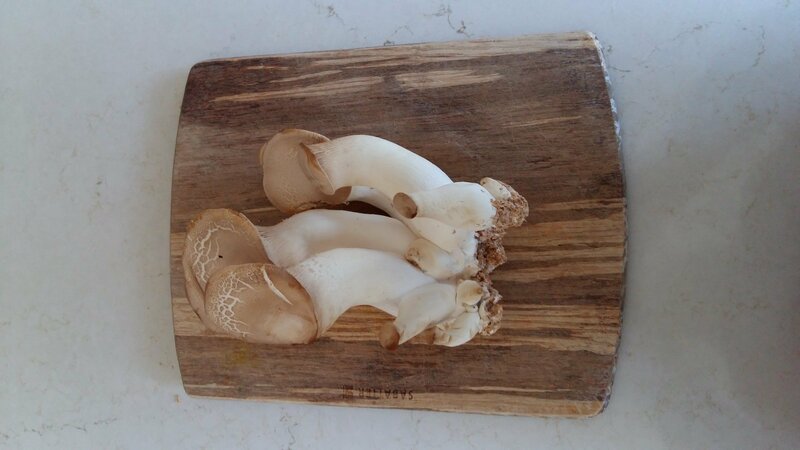 Unlike other oyster mushrooms that grow in fan-like formations, king oysters have a distinct stem and rounded cap. Prized by chefs, this “noble” mushroom lives up to its name with its delicious flavour and meaty texture, not to mention its grand size (a single mushroom can weigh up to 1 pound!). We prefer to grow this beauty inside but it can also be grown outside in garden beds. Hardwood forests growing on the roots of trees and emerging through the ground. benefits from a casing layer of 50/50 coir and vermiculite with 1% hydrated lime to minimize contamination. Timing of harvest depends on preference: younger mushrooms have better texture and flavour but older mushrooms are often prized for their large stems. Cut individual mushrooms at the base with a knife careful not to damage the block if subsequent flushes are desired.